After a long day of driving, we arrived in Mesa Verde National Park. We found a campsite right away. Apparently the season is already over here, so the only available spot in the park was a primitive campsite. We unhitched the pioneer, and explored the park with what little daylight we had left. About 1,400 years ago, the park was home to the Anasazi people, ancestral Puebloans. Today it preserves the elaborate stone communities they built in the sheltered alcoves of the canyon walls. Their structures stood up to all the elements of nature and are in excellent condition to this day. A strange and interesting place. Back at camp, the sun went down and temps dropped drastically into the 20's. I got to work on this hearty soup, inspired by southwestern flavors, and packed with fresh ingredients. In a medium sized pot, medium heat, heat ½ cup of the broth, potatoes, onion, garlic, chile pepper, smoked paprika, chipotle powder, liquid smoke, cumin, and oregano. Cover pot, simmering about 5 minutes. Add the rest of the broth, and cook 10 min, covered. Reduce heat med-low. Add tomato, beans with bean liquid, nutritional yeast, & kale. About 10 more minutes, covered. While that is cooking, heat oil in a pan, med-low heat. Add tortilla strips and a pinch of salt. Fry strips until golden brown and crispy. Remove from heat. Remove soup from heat, and stir in spinach and cilantro. Ladle soup into bowls and garnish with tortilla strips. Serve immediately. A classic Middle Eastern dish, delicious, packed with flavor, and naturally gluten free and vegan. Falafel is usually deep-fried, but my version is sautéed, which is not only healthier but much easier to make at home, or in your RV! You will love this fresh, tasty, and easy recipe that can be whipped up in less than 30 minutes. Falafel pita with cucumber, lettuce, & tomato. In a large bowl, mash the chickpeas with a fork (or process in a food processor). Add all other ingredients except olive oil. Stir to combine. Press a spoonful of the mixture into your palm, then roll into a ball approximately 1 ½" thick. Repeat with the rest of the mixture. Heat pan to medium, add olive oil. Sauté balls in oil, rolling often medium heat for 15-20 minutes. Serve hot. Falafel is excellent served over rice with a side of veggies, or in a pita with lettuce, tomato, avocado, and cucumber. * For a great sauce, try mixing some dill & sriracha sauce into a vegan mayo, tahini, or vegan yogurt. Garnish with fresh cilantro. You can find garbanzo flour like this in the baking section of some grocery stores. We are on the homestretch. Tomorrow is my husband and my last day of work. Then in a couple of days we take to the open road! We have plans for some interesting stops around the country. East, west, north, and south...coast to coast. 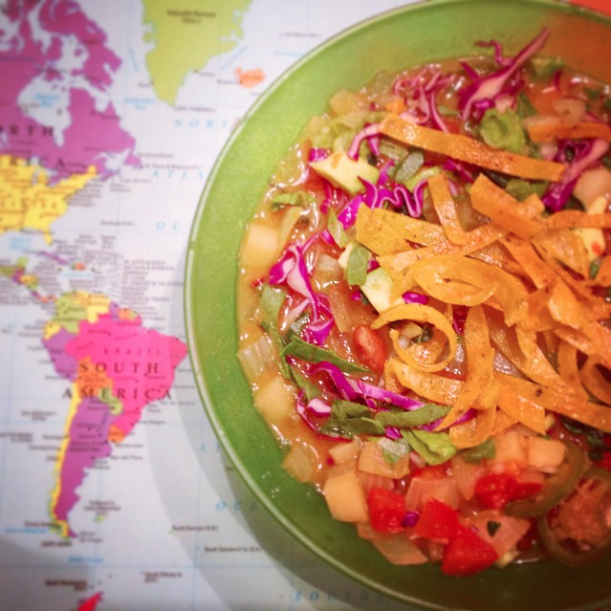 RVing, cooking tasty vegan fare, sightseeing, hiking, camping, rock climbing, visiting family, and spending time in some very unique places. This is a dream come true for me, I couldn't think of anything I'd want to do more than what we are about to do. Well, enough about my awesome life. Here's a recipe to spice up yours! Medium heat: In a large pan that has a lid, brown orzo in oil, with garlic powder and salt. Once orzo is toasty golden brown, add jalepeno, cayenne, onion, paprika, garlic, and nutritional yeast. Reduce heat to low and cover pan, stirring often, about 10 minutes. After 10 minutes, add peas (or edamame) and mushrooms. Simmer another 5 minutes or until orzo is tender. Remove from heat and stir in spinach. Let stand 5 minutes. I had a conversation with a co-worker yesterday. She said, "My science teacher in high school once told me my nails would be healthier and stronger if I eat Jello." I told her that I thought there was no way Jello could be beneficial to your health, it's not even real food. We went back and forth like this. But it got me thinking, where do people come up with this stuff? Someone reads a study, that study was funded by Jello (for example), and the people who read it are like "Nice! I will eat lots of Jello and I will have great nails!" Examples of these misleading studies are everywhere. Even in produce. Did you know that a serving of broccoli has more vitamin C than an orange? The orange industry just picked a positive vitamin, and used it in their advertising and all of a sudden, an orange is the image America pictures when they hear vitamin C.
Milk gives you strong bones and a healthy body, right? Milk drinking countries such as the US, have more cases of osteoporosis and bone issues than any countries that consume very little or no dairy. No animals drink the milk of a different animal, except humans. Maybe we don't need it! I've been looking at basic nutrition with a different eye lately. Fad diets and American's idea of what is healthy for them, often comes from multimillion dollar industries that are spending top dollar to make you think that. You surely can't believe everything you hear about nutrition. Common sense is a good start. Vegetables are good! All of them. Ok so maybe you don't care about all that. Maybe you just don't want to give up things that you like. I get that. Try this! Pepperoni crust tastes just like pepperoni. Soft, decadent almond cheese will leave your cheese cravings 100% satisfied. Load that pizza with toppings of choice such as I did with fresh baby spinach & mushrooms, and you will be one happy camper! In a small bowl, mix ketchup, liquid aminos, and liquid smoke. Add the warm water and stir. Stir in yeast and let sit about 5 minutes until yeast gets all foamy. Meanwhile, in a Lg bowl, mix flours and all spices together. Once wet mixture is foamy, add wet into dry mix and stir. Knead dough for 3- 5 min to combine. Let sit in the bowl, covered by a towel for at least 30 minutes. Preheat oven to 500º. On a small greased (I use olive oil) baking sheet or 12" pizza pan, sprinkle cornmeal over pan. Divide dough mixture in half and slowly stretch dough with your hands. Pretend it's a steering wheel and make a looong left turn. Place stretched dough on the pan, and gently push the edges outward until the dough fits the pan. Top with almond cheese, and any other toppings you choose. Bake on top rack 5 minutes, than move to the bottom rack and bake another 5 minutes, or until golden brown. Serve hot. * Use other half for 2nd pizza, or roll into little balls coated with garlic and fry in a pan for pepperoni garlic balls. Yum! Leftover dough can be stored in a plastic bag in fridge for up to 4 days. If you try this recipe, please leave me a comment and let me know what you think! As you may already know, I cook with a lot of spices. Cooking with spices = scented food. Scented food attracts all kinds of critters, including bears. Don't be scared! You can avoid rare bear encounters with a few tips for RVing in bear country. - Never leave food outside, no scraps, not even in dishwater, no garbage. If animals have access to your food, they will not only try it, which is not good for them, but they'll come back again, looking for more. Feeding wildlife can make them very aggressive, which can cause safety issues to people, pets, and can result in enforced death to the wild animal now causing problems. - Keep all garbage and recyclables inside until they can be put in a bear proof dumpster bin. - Dump any leftover scented soups, sauces, or dish scraps down the toilet. Not outside. - Food inside the RV should be hidden in cabinets or out of sight, especially in parks and campgrounds with smart bears that know what to look for. - Never leave windows, doors, or vents open when you're not around. No matter where I am, I always dream of somewhere else. I got the bug. The great big travel bug. I love Colorado, and think it's spectacular views might beat every other state. But, more than anything, I get tired of my job, and immediately get the urge to move on. Working seasonal jobs helps me make that possible. I've been day dreaming a lot lately...about Southern California. I lived in San Diego for a few years and it really left a warm place in my heart. Sun, beach, sandstone cliffs, tropical flora, an abundance of avocados, fresh tortillas, and great coffee shops. This no fish taco with coleslaw recipe is totally inspired by Southern California. 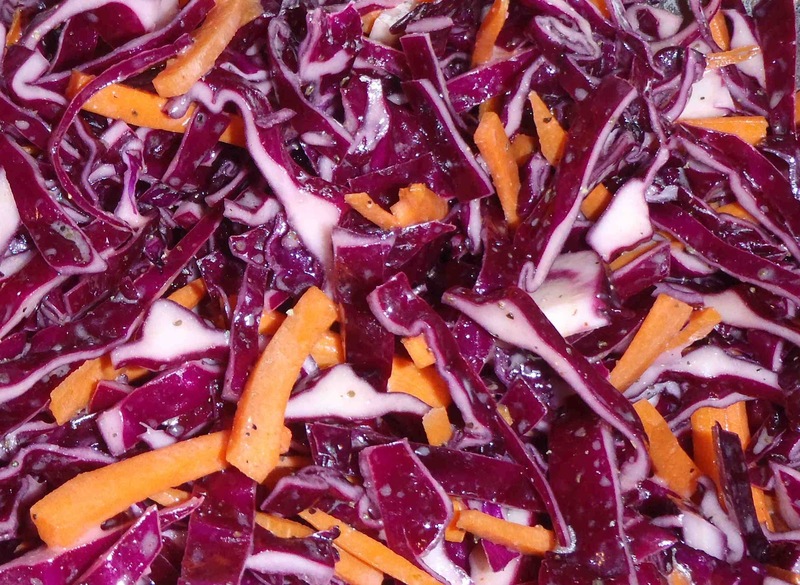 You will have leftover coleslaw that will be great on sandwiches and on its own as a side. It's a killer vegan slaw. I make it all the time and put it on everything. -mix it all together and let it sit covered for an hour or so, to develop the flavors. * I use celery seed instead of celery all the time, because it tastes exactly like celery but it fits in a very small space while celery is kinda bulky. It's an RV small space thing. Feel free to use a chopped celery stalk instead of the seeds. - Marinate tofu strips in soy sauce or liquid aminos. In a small bowl, combine cornstarch and breadcrumbs. Heat pan med/high, add oil. Dredge marinated tofu in breadcrumb mixture. Sauté breaded tofu a few minutes on each side, until golden brown. Remove from pan and set aside. Add spinach to the pan for a few seconds, just until it juuuuust starts to wilt. Remove from heat. 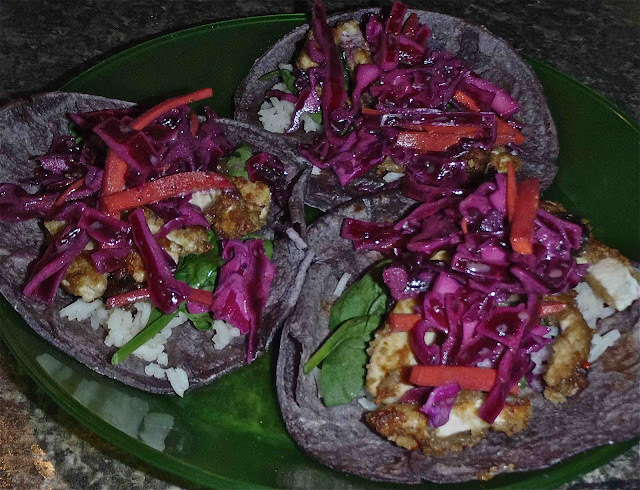 Divide up rice among the 6 tacos, same with the spinach, then tofu, then the slaw on top. Squeeze lime juice over the slaw. Serve immediately.